In keeping with the “spirit” of October, All Hallows Eve or Samhain (take your pick) I’ll continue with two of our local cemeteries reputed to come with a “little something extra”. For each, I’ll give the alleged haunting first with history second. HAUNTING: Since I was a kid, I’ve heard stories of people who SWORE they saw someone pass them as they were reading the stones, only to look up as they passed and find no one within hundreds of yards of their location. A former resident of the caretaker’s house reports playing hide-and-seek type games when he was very little with children he only later realized could NOT have been there (no wonder they were so hard to catch!). The caretaker’s home itself has had a certain number of reports of footsteps, doors opening and other haunting type phenomenon all around the structure – not a surprise perhaps as two different former caretakers suicided there. One extensive reporting of “Phantom Walkers” regards a young woman in jeans who walks vacantly past in broad daylight. This apparition began shortly after the burial of a young lady who’d been killed in a car accident, and her boyfriend told me the outfit that witness claimed the spectre was wearing sounded exactly like her favorite. HAUNTING: The legend has remained the same for a long, long, LONG time. I can find references to it in Nyack histories going back as far as the late 1800s. A Revolutionary War era soldier sits his lonely sentry post atop one of the stones, musket forlornly held across his lap, awaiting a relief guard who will never come. I always thought it far more tragic than scary, and as a teenager we used to walk by on autumn evenings hoping to catch a glimpse of him… but we were perhaps too noisy, too intrusive, and perhaps too much WANTING to see something that a whole gaggle of us might have simply been too much, if indeed it is even possible that a solitary disincarnate guard WAS still protecting Nyack from the Redcoats. I will say that it is a mournful, melancholy place at night – less frightening, more sorrowful. It was not until many years later when I was 40, riding by on my bicycle at dusk on my way from Marydell that something odd occurred. Braking hard to keep control on my way down Old Mountain Road, I noticed somebody leaning on one of the stones downhill from me in the old cemetery, looking like he was smoking or something. Immediately I thought the police were going to be annoyed that someone was in there after dark, but wasn’t going to bother him. That’s when I saw the sign – I had not seen the new historical marker they had erected and skidded to a halt to read it. And noticed I was alone. No one was in the Burial Ground, nor was there a deer or a bush or anything that might have fooled me. Either I had been mistaken in the gloom of twilight and my subconscious mind chose the shape from my teenage love of the legend of the cemetery, or… well… or I finally saw him. The soldier. If he’d waited, I’d have relieved him for a while… it’s the least I could do for one of our original veterans. 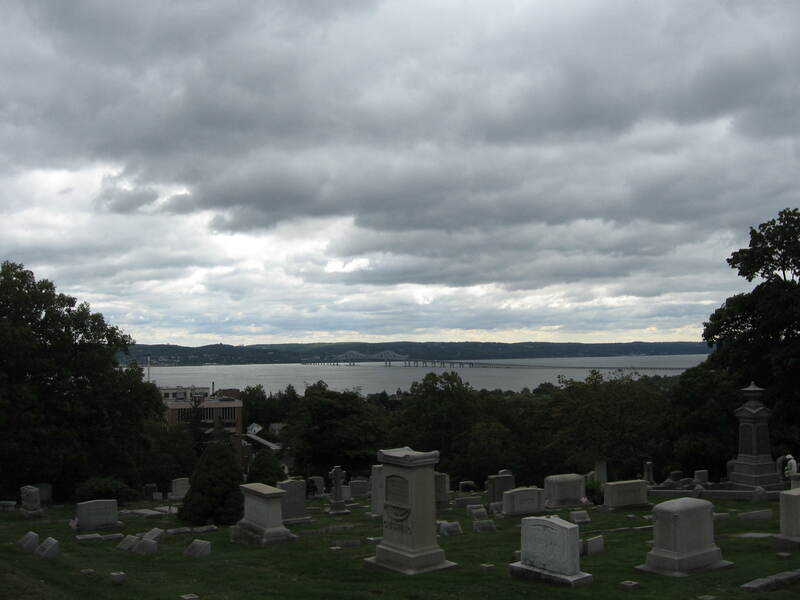 You can check out the investigation of the Old Palmer Burial Ground by NPI – Nyack’s own Father/Son team of Paranormal Investigators – that was performed in 2009 by linking over to their site (on another tab, of course!) at: http://64nywf65.20m.com/uncem/uncem.htm. HISTORY: The Burial Ground began operation in the 1730s, on the land of Corneilius Kuyper who was the original settler of this area of Upper Nyack in 1686. Kuyper himself was the first burial in 1731 and his wife Aeltje followed him 4 years later. There are 66 graves, including 3 Revolutionary War soldiers. I do not know if “our” soldier is BURIED there, or was supposedly KILLED there… (which is entirely possible, if you read my “Today in Nyack History” post that will appear tomorrow, October 15). If he is buried there, then he is likely to be Corporal Philip Sarvent as neither a Captain nor a Major would have been on sentry duty along the only road from Rockland Lake to the Hudson during the Revolution. 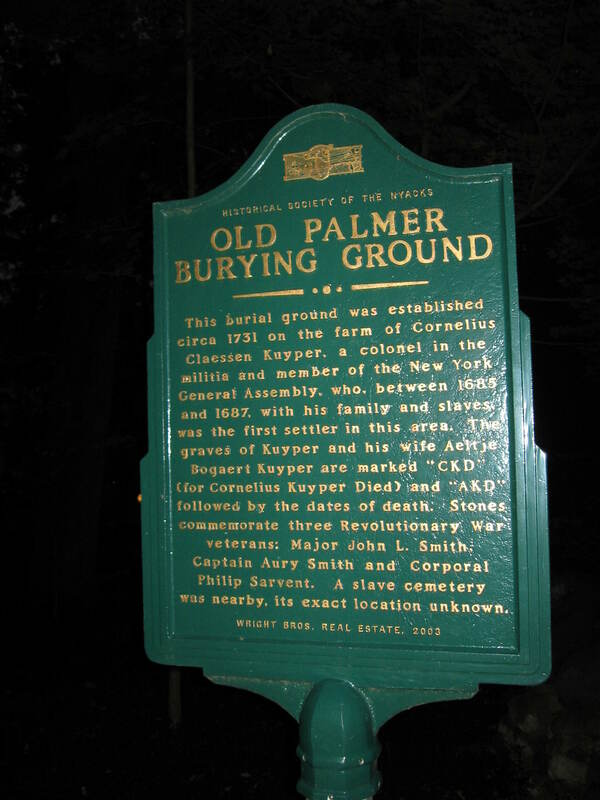 The Old Palmer Burial Ground is on the north side of Old Mountain Road in Upper Nyack between Midland and Broadway. 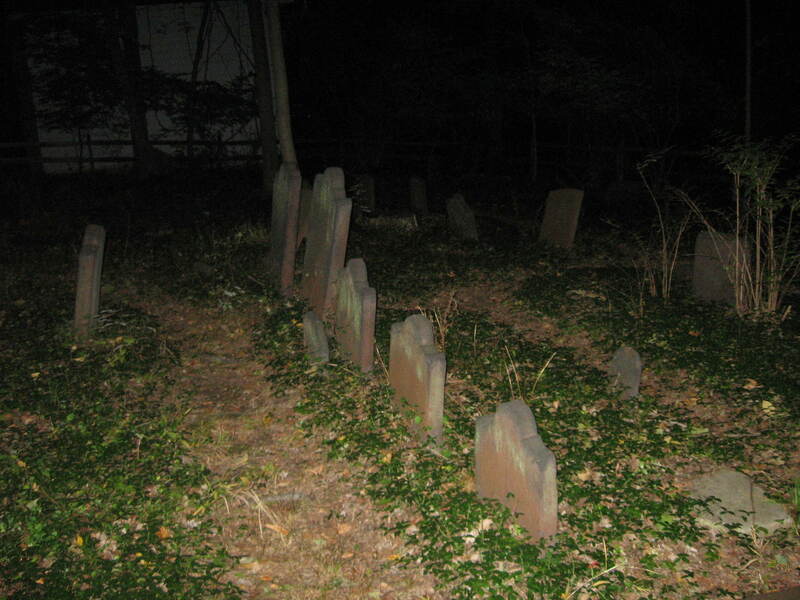 It is easily accessible from the road, but remember that cemeteries are generally off-limits at night (I stood at the gate to take my pics) and somewhat dangerous – not from spooks mind you, but from uneven ground, sinkholes, knocked over tombstones, exposed roots and sadly, deer ticks. The Burial Ground is administered by the Town of Clarkstown so get permission if you want to do any kind of research there. The nifty historical marker was a gift from another Nyack realtor, Russ Wooley.